Rasams become an inevitable part in all the traditional South Indian lunch menus. 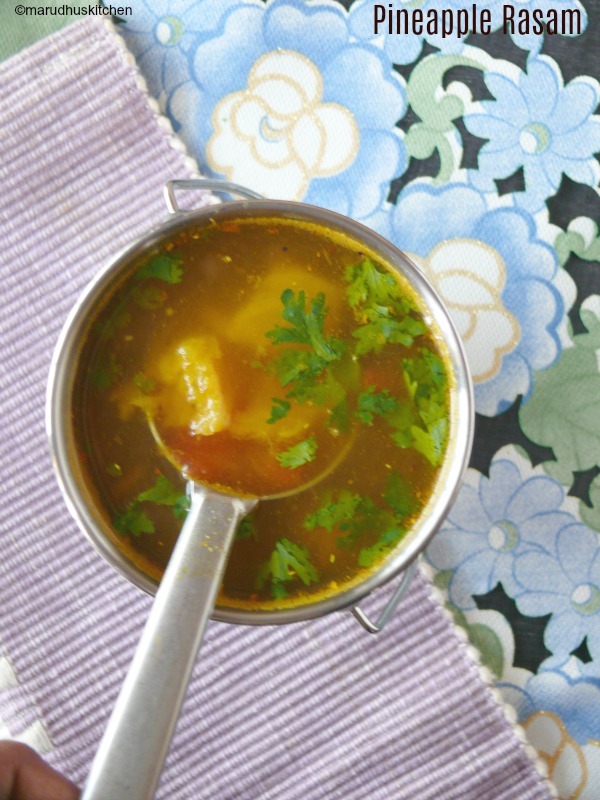 This Pineapple rasam is a special south indian speciality with tangy sweet flavour with all the goodness of wholesomeness. Rasam making is an art and once you are well worse in the nuances of making rasam you can make any rasam. 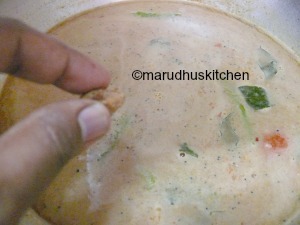 My mom says that if you are able to make a good rasam then you will be able to make any kind of cooking just on the go. 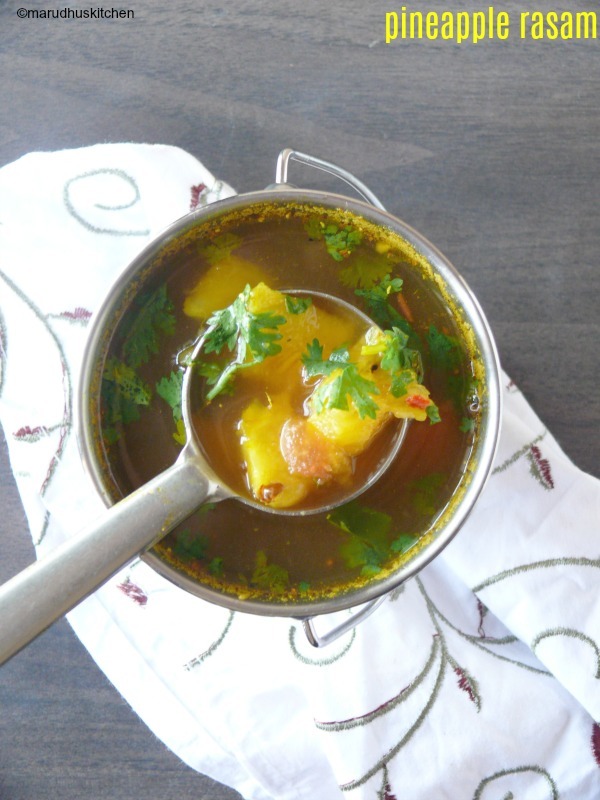 Each type of rasam are made differently and for this pineapple rasam it should not boil. When white foam forms have to switch off the stove and thats the right consistency. This has become one the favourite rasams that I do at my home.This is the first time that I have tried this rasam and it has turned out to be totally rewarding. I have used Tangy tomatoes and it had sufficient tanginess so I didn’t add any tamarind Juice. Try this rasam for sure and try hot with white rice and some side dish like appalams,any fry or any poriyal of your choice. 1.chop pineapple making one cup. 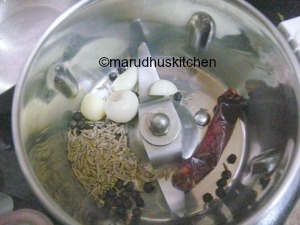 2.First we will see the grinding part,grind cumin,pepper,garlic and chillies and keep ready. 3.Then grind pineapple and tomatoes to a smooth paste and keep them separately. 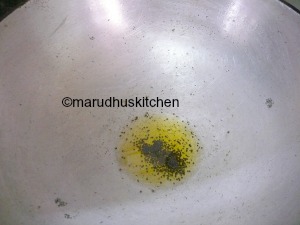 4.Keep a kadai add ghee when it heats up add mustard to splutter,then all the ingredients given “to temper”. 5.Add chunks of pine-apple and tomatoes and saute them by adding salt. 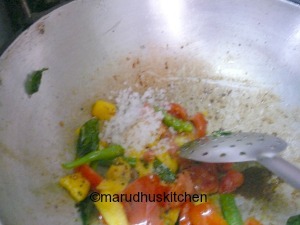 6.When tomatoes are soft add the masala powder and stir well. 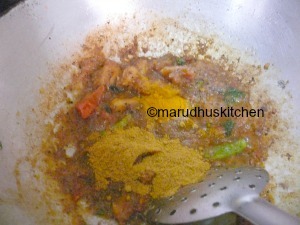 7.Then add the puree,sambar powder and turmeric powder. 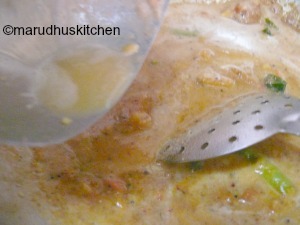 8.Stir well and let it cook for few seconds,then add the mashed dal mixture that is diluted with water. 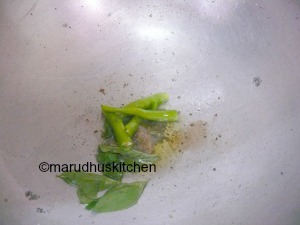 9.Now add the needed salt and also add needed water to bring it to rasam consistency. 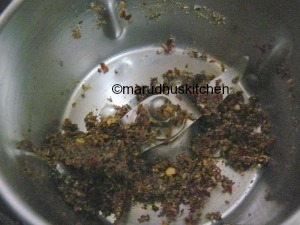 10.Add jaggery and finally add chopped coriander. 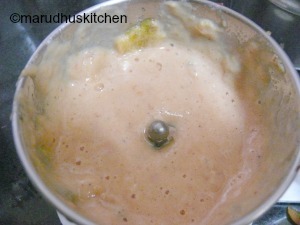 11.When white foam forms in the rasam,that’s the right consistency to switch off. 12.Finally add reserved pineapple pieces and serve hot with rice. First we will see the grinding part,grind cumin,pepper,garlic and chillies and keep ready. Then grind pineapple and tomatoes to a smooth paste and keep them separately. Keep a kadai add ghee when it heats up add mustard to splutter,then all the ingredients given “to temper”. Add chunks of pine apple and tomatoes and saute them by adding salt. 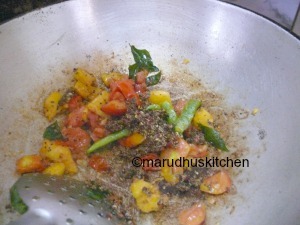 When tomatoes are soft add the masala powder and stir well. 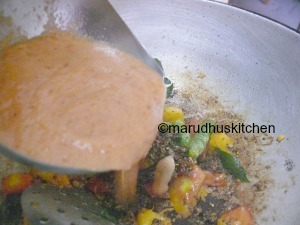 Then add the puree,sambar powder and turmeric powder. 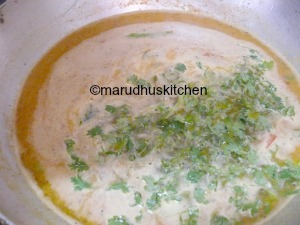 Stir well and let it cook for few seconds,then add the mashed dal mixture that is diluted with water. Now add the needed salt and also add needed water to bring it to rasam consistency. Add jaggery and finally add chopped coriander. When white foam forms in the rasam,that’s the right consistency to switch off. Finally add reserved pineapple pieces and serve hot with rice. 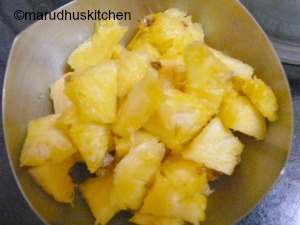 Take nice sweet and tart pineapple and tomatoes also should be tangy enough to give the rasam the exact flavour. Adding pineapple chunks are optional. Don’t leave the rasam to boil,it will spoil the whole flavour. Some times if tomatoes are not tart enough tamarind juice can be substituted. We can do the same rasam without dal also it will be good.